This week, Professor Stephen Hawking died at the age of 76. One of the proudest moments of my life was flying him -- the world's expert in gravity -- into zero gravity. I've shared this powerful story on the TED stage and in previous blogs as a testament to grit, passion and persistence. This week, I'm reprinting the story to commemorate Dr. Hawking's life. It was an honor to know him. In 2007, I had the incredible opportunity to fly Professor Stephen Hawking aboard a specially modified Boeing 727-200 aircraft called G-FORCE ONE. What made that flight extremely special was the opportunity to offer Dr. Hawking total freedom after being wheelchair-bound for more than 40 years. This blog is about that powerful story and the lessons learned in doing something hard and potentially dangerous. When I was in graduate school, I was desperate for a ride on NASA's zero gravity (parabolic flight) airplane. I wanted to experience weightlessness like NASA's astronauts in training. I tried everything to get aboard (including volunteering as a medical guinea pig), but could never score a seat. Finally, in 1993, after partnering with two friends (Byron Lichtenberg and Ray Cronise), we started a commercial company (Zero Gravity Corporation or ZERO-G) to offer this same experience to anyone who had the desire to go. But getting the FAA's full permission to start this service for the public took a while -- 11 years, to be exact! After starting the company in 1993, we finally received approval from the FAA to operate under "Part-121" operations. Our first flight in mid-September of 2004 was for the filming of Richard Branson's TV show "Rebel Billionaire." Since then we have flown over 25,000 people into weightless, aged 9 to 93. I first met Professor Hawking back in 2007 during conversations regarding a genomics-related XPRIZE. At the end of our conversation (which took place with the assistance of his secretary), he asked me if I could help him get on a sub-orbital flight in space. I explained that I could not at the moment, but instead offered him a flight aboard G-FORCE ONE to experience weightlessness, and suggested that we make that flight a fundraising event in support of ALS research. He accepted, and we issued a press release. This proclamation by the FAA infuriated me. The answer was: "I guess it would probably be Professor Hawking's physicians or space-medical specialists." That answer was good news. Next, I purchased a malpractice insurance policy for a few key physicians, and obtained from them three signed letters of support submitted to the FAA stating, "that Hawking was able bodied for a zero-g flight." To maximize the chance of a safe flight, we set up an emergency room onboard G-FORCE ONE and supported Professor Hawking with four physicians (among them Dr. Erik Viirre) and two nurses accompanying him on the trip (monitoring heart rate, respiration, blood pressure, etc.). At the pre-flight press conference, we announced our intention to fly the Professor on a single 30-second parabola, and maybe, if everything went perfectly, a second arc. The first parabola went so smoothly, and Hawking was having such a great time, that we flew a second, and a third... and another and another. In total, we made eight arcs with him aboard. 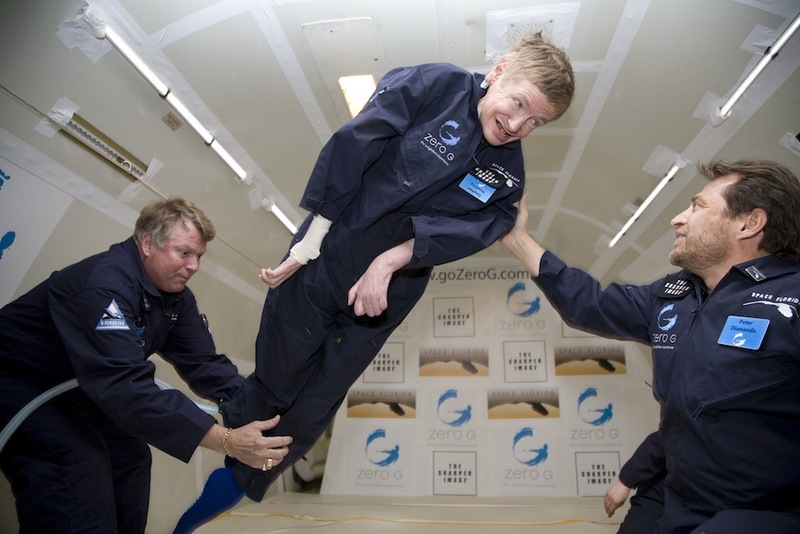 On the heels of this successful flight, with Hawking showing a disabled individual could safely fly in zero gravity, I was very proud that we next had the amazing opportunity to fly six wheelchair-bound teenagers into zero gravity. These were kids who had never walked a day in their lives, yet they got to soar like Superman on their flight. Perhaps the most important lesson here is that of Passion and Grit. No one would have endured an 11 year "startup" and the continual stream of "no's" unless my co-founders and I were so absolutely passionate about making this happen. The complement to passion is grit, the absolute commitment to making it happen. None of this would have happened without grit, creativity, and passion from our team. Allow me to explain. When someone says no, it's often because they're not empowered to say yes. In many organizations, the only person who can say yes to a difficult or non-standard situation is the person at the top the food chain, in my case the FAA Administrator. If you believe something is your passion, your highest calling, don't give up when someone tells you that you can't do it. Simply gather yourself and find the next person up the hierarchy and begin again. Another common fear is known as Murphy's Law – if anything can go wrong, it will go wrong. Stuff goes wrong. Expect it, learn from it, fix it—that's how remarkable things happen. With a mix of creativity, grit, and passion, you can accomplish almost anything. Interested in going on a ZERO-G flight?